1 of 5 Cook pasta following package directions. Drain. 2 of 5 While pasta is cooking, heat grill pan or broiler. Sprinkle chicken with the lemon juice and grill or broil for about 2 minutes per side or until internal temperature reads 160 degrees F on an instant-read thermometer. Set aside and let cool. 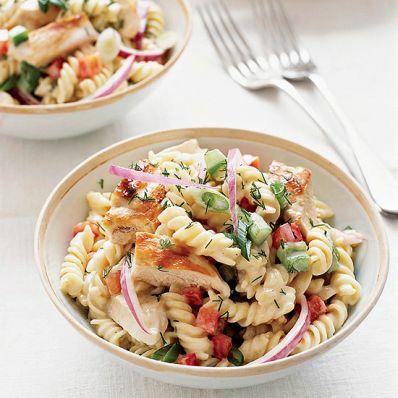 3 of 5 When cool, cut chicken into bite-size pieces and mix with cooled pasta in a large bowl. Add diced peppers, onion, scallions and dill. 4 of 5 In a medium-size bowl, whisk mayonnaise, vinegar, honey, mustard, sugar, onion powder, parsley flakes, salt and black pepper. Gradually whisk in the oil. 5 of 5 Pour mayonnaise mixture over the pasta and chicken and toss. Refrigerate until ready to serve. Per Serving: 3 g sat. fat, 76 mg chol., 514 kcal cal., 409 mg sodium, 2 g fiber, 30 g pro., 25 g Fat, total, 43 g carb.